have many gun slings to choose from. This LOK-DOWN sling swivel kit from Blackhawk is designed to fit the Mossberg 500 pump-action shotgun, allowing you to equip it with a two-point sling for convenient hands-free portability. The tough all-steel swivels are precision manufactured in the United States for extreme quality and strength, giving them durability that you can trust with your life. 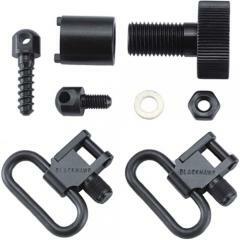 The threaded lock-down plunger attaches securely to standard swivel studs to create a reliable positive connection with the firearm. Installation is easy and, once attached, they stay attached until you decide to remove them.